Translator and free, easy and quick to use voice. You can translate to and from +45 speak different languages ​​and the translator. You can translate from English into Spanish and vice versa, but you can also translate from Spanish / Portuguese, Spanish / French, and many more.The multi language voice translator Google is a very comprehensive tool to perform translations in a simple way. We assure you that will surprise you and you can use +45 languages. 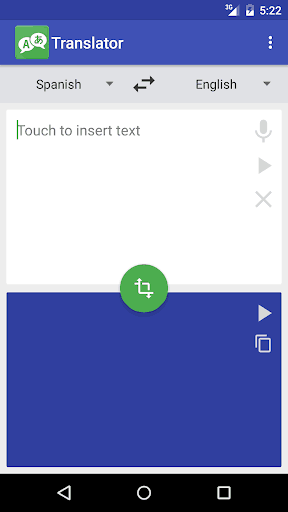 With the translator you can manually enter text or talk, you have a translator from English to Spanish and many more languages ​​available in your pocket anytime you want. Can you imagine being next to an Englishman and to record your voice and translate it? With our translator is possible, download and try the latest technology in the translation of integrated voice application. Arabic, Basque, Belarusian, Bengali, Bulgarian, Catalan, Chinese Traditional, Croatian, Czech, Danish, Dutch, English, Estonian, Finnish, French, Galician, German, Greek, Hindi, Hungarian, Indonesian, Irish, Italian, Japanese, Javanese , Kannada, Korean, Latin, Latvian, Lithuanian, Malay, Maltese, Norwegian, Persian, Polish, Portuguese, Romanian, Russian, Serbian, Slovenian, Spanish, Swahili, Swedish, Tamil, Thai, Turkish, Ukrainian, Urdu, Vietnamese … etc . Arabic, Basque, Belarusian, Bengali, Bulgarian, Catalan, Chinese Traditional, Croatian, Czech, Danish, Dutch, English, Estonian, Finnish, French, Galician, German, Greek, Hindi, Hungarian, Indonesian, Irish, Italian, Javanese, Kannada , Korean, Latin, Latvian, Lithuanian, Malay, Maltese, Norwegian, Persian, Polish, Portuguese, Romanian, Russian, Serbian, Slovenian, Spanish, Swahili, Swedish, Tamil, Thai, Turkish, Ukrainian, Urdu, Vietnamese … etc. * You need to be connected to the Internet to translate.